Excitement came back with the second year of Hong Kong University’s Architecture Faculty’s Summer design workshop. As far as what I’ve heard, we would be doing a 1 to 1 scale fabrication this year, which would be a much more exciting exercise for all. Teaching staff include Yan Gao (Director), Olivier Ottevaere (Director), Paul Mui and Jaenes Bong from Aedas and myself. Although there might be more. 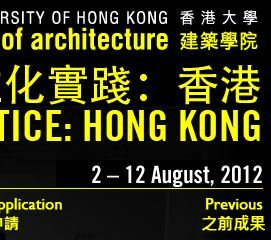 I realized some students who came last year to the workshop, coming back to HKU’s M.Arch programme this year. Perhaps we have successfully portrayed a rather positive computational atmosphere here and I hope they are finding this interesting. After a year working in a private firm, R&D on component based architecture with CNC machinery, I think I have more to show and more to share this year. Exactly what, I cant tell. But definitely more on how the digital can be translated to the reality and how to manage such digital project that is larger then a scaled model. The official application deadline is over, we have nice mix of applicants from all over Asia, Europe and US. It should be fun to watch the chemistry happening with the group based design exercise they are about to experience. The challenge should be to compete their design ideas against other teams to win the honor of realizing their design in 1 to 1. I’m not sure if there are still a seats for the last minute applicant, I hope there will. For a successful architectural project, the efficiency of design communication and the control of information-flow are as important as the creativity of ideas. In response to the concurrent digital evolution emerging in the architectural industry world-wide, the Department of Architecture at The University of Hong Kong will host a two week intensive summer program named Digital Practice. Led by professors from The University of Hong Kong, as well as invited practitioners with expertise in practice of cutting edge digital techniques, the program offers participants opportunities to experience applications of computational tools during different stages of an architectural project, i.e. concept design, form finding and optimization, delivery, management and communication of design information under the team-based working environment. By learning advanced computational techniques through case studies in the context of Hong Kong, participants are expected to go beyond the conventional perception of technology, considering users and tools as a feedback-based entity instead of a dichotomy. The program, which is taught in English, includes a series of evening lectures related delivered by teaching staff and invited local architects.